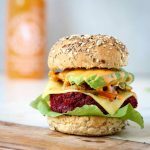 This easy vegan beet burger recipe creates a juicy, smoky and tender burger patty that’s perfect for quick dinners, packed with protein, while being healthy and delicious too! One of my favourite places to grab a bite is Conscious 108, a local vegan restaurant. 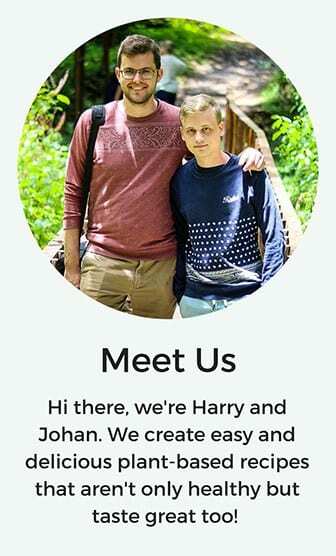 Whenever Johan and I visit a new restaurant we always order something different and share it between ourselves. Their beet burger is so good that the second time we ate there we both ordered them and no sharing happened whatsoever. 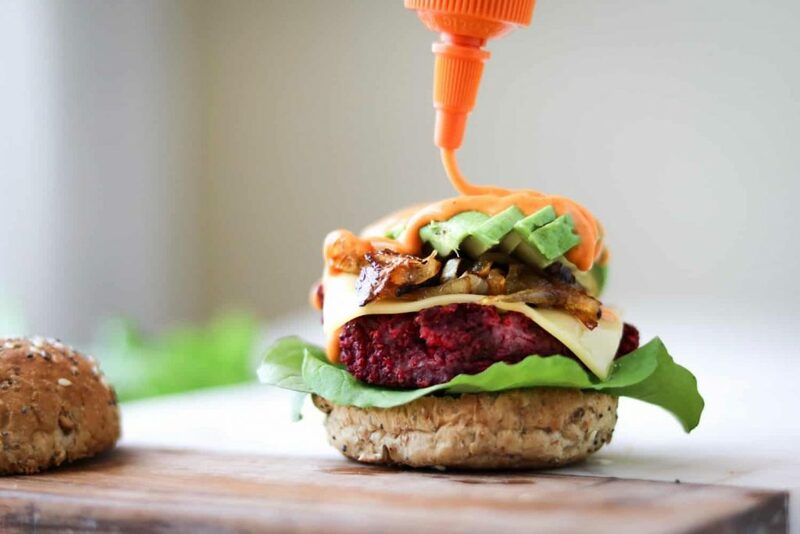 But, as we live a little too far from Conscious 108 to go there whenever we want to, I wanted a recipe for beet burgers that gave me similar results just so that I could eat these beauties from the comfort of my home, anytime I craved them. I tried a few recipes but found that the majority of them used quinoa, black beans or egg replacer and I wanted to get similar results without using those ingredients. For my recipe I focused on getting the taste 100% right (hence the 7 spices I added) and the result? A juicy, smoky and tender burger patty that’s perfect for quick dinners, packed with protein, while being healthy and delicious too! Toasting the buns – I find this to be a crucial step in assembling your burger, by not toasting the bun the sauces can make it go soggy and a mess to try and eat. If you have a grill or a griddle pan I recommend searing the patties after baking them as this intensifies their flavour and firms them up even more. Pairing it with the right sauce is crucial in balancing all the flavours in the burger. 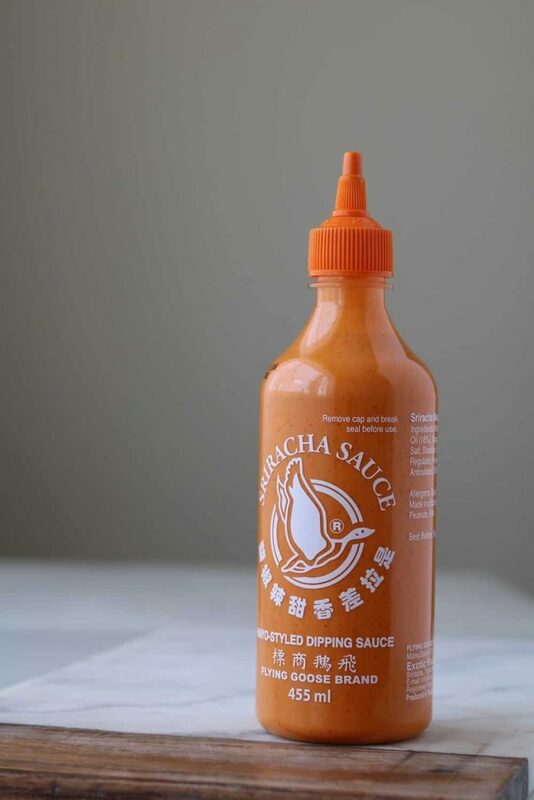 I use this sriracha mayo as it gives the burger a spicy kick along with the richness of the beet patty. I find that just one of these burgers is more than enough to fill me up (as long as I serve it with these sweet potato fries) and this inevitably leaves 7 patties left over. So, before baking them, store the beet burger patties you’re not going to eat that day in the freezer, separated by parchment paper. I find them perfect for when I have had a long day and don’t feel like major effort for dinner and also don’t want to get take-out. So, I take these out of the freezer, bake them from frozen for slightly longer and they come out perfectly. Slather them with some sriracha mayo, slice some avocado over and bam! A hearty, healthy and smoky beet burger ready to go. You will need a food processor to make the beet patties as the patty mixture is rather thick. I use this Breville one for a lot of my recipes as I find it powerful enough to make short work of anything. You can use a smaller food processor like I had to before I got the Breville but just make sure to split up the beet patty mix and process it in batches. A juicy, smoky and tender burger patty that's perfect for quick dinners, packed with protein, while being healthy and delicious too! Bring the lentils and water to a boil in a medium saucepan. Once boiling reduce the heat and, stirring occasionally, allow the lentils to simmer uncovered for 10 minutes. Strain and set aside. Heat the coconut oil over medium-high heat in a large sauté pan. Mix in the onion, garlic, 1 tablespoon of the coconut sugar, paprika, onion powder, garlic powder, cumin and allspice. Allow to cook for 8 minutes, stirring occasionally, until the onions are soft and light golden brown. Transfer the mixture to a large mixing bowl, and add the reserved 3/4 cup rolled oats, the cooked onion mixture and the remaining 1 tablespoon coconut sugar. Thoroughly stir to combine and you should be left with a damp mixture that is able to hold its shape. Chill the mixture for at least 30 minutes in the fridge (to make it easier to form into patties). About 10 minutes before you're ready to form the patties, preheat the oven to 400F/200°C. Use a 1/2-cup measuring cup to scoop out 1/2 cup of the mixture and form the mixture into a patty that is 1-inch/2.5 cm thick and 3 inches/7.5 cm in diameter and place on a baking sheet lined with parchment paper. Repeat until you have made all of the 6-8 patties. Bake the patties for 25 minutes for a more tender burger or 30 minutes for a firmer one. The bottoms of the patties should be browned up and feel set once done. Remove from the oven and cool completely on the pan before moving as they can break apart if not cooled down 100%. 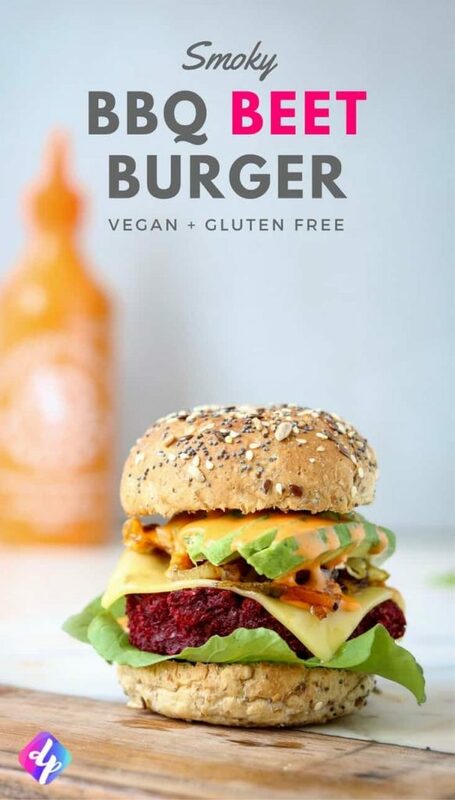 Serve with some sliced avocado, sriracha mayo and tomato on a toasted burger bun with a side of sweet potato fries and enjoy! This recipe was inspired by Minimalist Baker’s Black Bean Beet Burgers. Have you ever made veggie burger patties before? If this was your first time, let me know in the comments below and give me shout on Instagram with #deliciousplants so I can take a look! Do you need an even simpler veggie burger recipe? Why not give our easy falafel burger recipe a try?